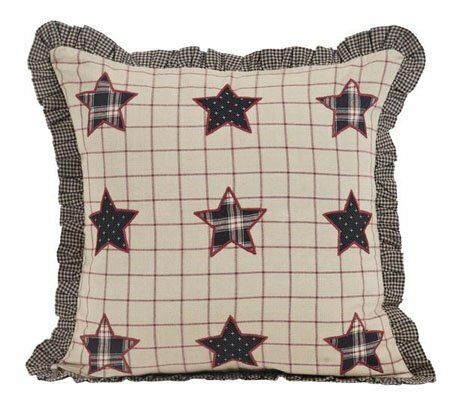 The Bingham Star 16" Fabric Applique Star Pillow features nine applique 5-point stars set on a red and tan windowpane printed fabric with a ruffle in black and creme micro-check around the edge. Reverses to chocolate brown with black ditsy star fabric and a two button closure. The back features a 3" overlap with 2-buttons to conceal pillow insert. 16" x 16". Pillow fabric is 100% cotton. Pillow fill is 100% polyester. This item is imported. Please note, colors may appear differently in different resolutions and on different computers. From The Victorian Heart Collection made by VHC Brands. Manufacturer's UPC code is 840528152511.